"The proximity of Swithland and its beautiful slate and the genius of native craftsmen have made Wymeswold churchyard one of the finest in England." Around the end of the 17th century the village masons of this area produced many boldly sculpted memorials Swithland (and later Welsh) slate and the churchyard of Wymeswold contains some of the finest examples. The virtuosity of style, which can verge on extravagant 'rococo' designs, at its best rivals elaborate metal-chasing in its skill of execution. Simply because slate withstands weathering so well this craftsmanship is still to be seen, often in near-perfect detail. It is generally agreed that the work of William Charles of Wymeswold is especially good. He was working between 1700 and 1730 and used an hourglass ringed with an orobus as his trademark. In common with other exponents of this craft, Charles was apparently self-taught from the writing manuals of time. His style changed with fashion and it is interesting to see, for instance, how the first word of the memorial change from a copperplate 'Here' to a centred, more typographical 'HERE'. Other members of Charles' family produced memorials; it is particular rewarding to find memorials by William Charles to his wife, and the memorial to him, done by his son (also called William). As with most of the older memorials, these are all to the south of the church. Other sculptors are Bass, Brown, Ferriman, Hickling, Hull, Roworth and Winfield. Consider well the slippery Path you tread. Nothing of certainty there's to be found. May end thy life and lay thee low as me. And lay you low as me. In brief to speak her praise let this suffice. All certain Symptoms of virtuous mind. I live, though friends beneath account me dead. How gladly would you change your state with me. And did me of my Pain. In Death's uncertainty thy danger lies. All expectation of the coming foe. And Fate surprise the nodding. So flourish these when those are past away. (John Fox "who suddenly left this transient world on the 22nd of September 1804"). A verse which occurs again and again begins "Afflictions sore long time I bore", others referred to "a pale consumption" and "wasting pain". The Incidence of deaths of males and females in their late teens and early twenties perhaps points to tuberculosis. In some families the children died within months each other, suggesting an epidemic of some kind. The imagery is more likely to be flowers, descending doves, mourners at a grave side, crosses and (by the late 19th century) angels. Changes in the wordings of epitaphs clearly reveal underlying cultural changes. The sentiments of the 18th century were no longer acceptable by the mid-19th century. 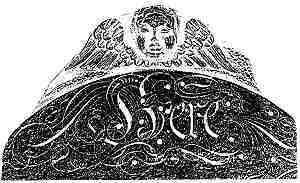 Winged faces are known locally as 'Belvoir Angels' and were intended to depict the soul of the deceased ascending to heaven. About 14 gravestones in St Mary's churchyard have such images; one tombstone has no less than six such faces.